You are on Access to Train Station. Skip to the next section. The train station is located on level - 1. 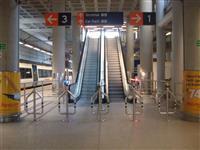 The train station can be accessed via lift, slope or escalator. You are on Lift (Tunnel 1 and Tunnel 2). Skip to the next section. 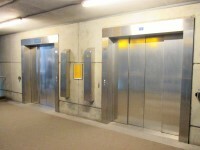 The dimensions of the lift are 170cm x 363cm (5ft 7in x 11ft 11in). The clear door width is 170cm (5ft 7in). The lift controls are 86cm - 104cm (2ft 10in - 3ft 5in) high. The lift has handrails on both sides. 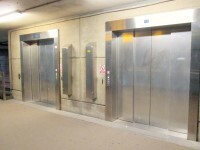 The lift is used to access Level -1 (Train Station), Level 0 (Short Stay Car Park, Coach Station, Meet and Greet, Valet Reception, Pick Up Point) and Level 1 (Terminal). You are on Lift (Tunnel 3 and Tunnel 4). Skip to the next section. 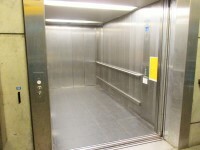 The dimensions of the lift are 168cm x 364cm (5ft 6in x 11ft 11in). The clear door width is 171cm (5ft 7in). 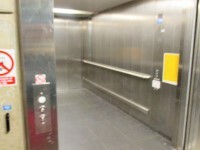 The lift controls are 85cm - 103cm (2ft 9in - 3ft 5in) high. You are on Ramps. Skip to the next section. There are 2 ramps leading to the train station. 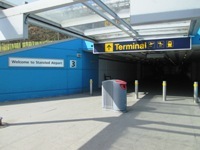 One ramp is located to the left of the terminal building, Tunnel 1 is the closest entrance to this ramp. 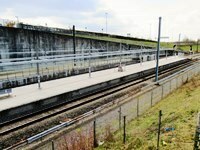 The other ramp is located to the right of the terminal building, Tunnel 4 is the closest entrance to this ramp. Both ramps are approximately 85m (93yd)long. You are on Escalators. Skip to the next section. 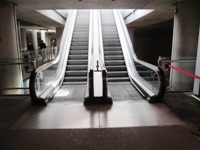 There are escalators leading from the terminal to the train station. 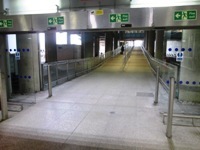 The escalators can also be accessed from any of the 4 tunnels leading from the short stay car park. This office is located in between platforms 1-3. 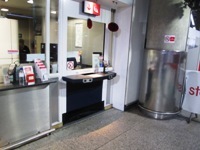 The ticket office is located on platform 3. The train companies operating from within this station are Stansted Express and Cross Country Trains. 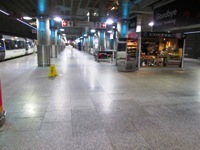 Shops and services within the station include Coffee Link. 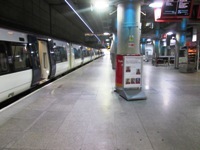 Platforms which have tactile markings at the platform edge are none. Accessible toilets are located on platform(s) 3. 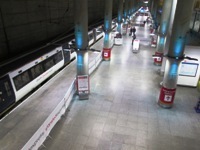 Fast, frequent and convenient trains run between Stansted Airport and London Liverpool Street, from early until late. Trains depart every 15 minutes. Average journey time 47 minutes to London Liverpool Street and 36 minutes to Tottenham Hale. Fares start from £12 when two or more people travel and just £8 when four of more people travel. First class fares start from just £37.50 and include large comfortable seats, fast track through airport security and executive lounge access at Liverpool Street and Stansted. For London Underground services, change at Tottenham Hale (Victoria Line) or Liverpool Street (Central Line, Circle, Metropolitan and Hammersmith & City lines). Long-distance services link the airport with Cambridgeshire and the Midlands. Connections are available to the North and Scotland. Hourly daytime service, reduced on Sundays. Journey times (approx): Cambridge 35 min; Leicester 2 hr 30 min; Birmingham 3 hr 25 min. Fares vary, discounts for advance booking. Trains run to Audley End, Cambridge, Ely, Peterborough, Leicester and Birmingham. Change at Peterborough for Leeds, York, Newcastle and Scotland. Change at Leicester for Derby and Sheffield. You are on Ticket Office and Machines. Skip to the next section. 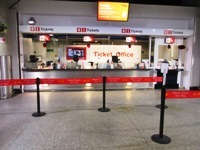 The ticket office is open 6.00 am to 23.59 pm 7 days a week. There is an adjustable counter at the ticket desk. 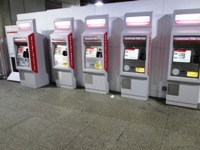 There are self service ticket machines available. There are two types of machines, both have tactile markings. The general machine controls are between 87cm (2ft 10in) and 120cm (3ft 11in) high. There are push pad operated automatic doors to access the waiting room. The doors are 125cm (4ft 1in) wide. The push pad is 102cm (3ft 4in) high. 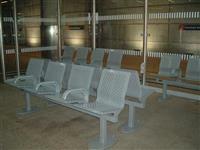 There is fixed seating available with armrests. The seats are 49cm (1ft 7in) high. 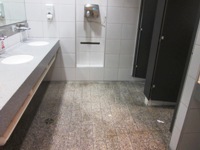 The accessible toilet is 50m (54yd 2ft) from the ticket office. The accessible toilet is located on platform 3. 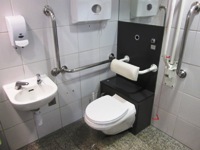 The dimensions of the accessible toilet are 180cm x 210cm (5ft 11in x 6ft 11in). 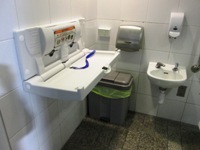 The baby change table in the accessible toilet once extended is 96cm (3ft 2in) high. The female and male toilets are located in the middle of the station concourse. The female and male toilets are 50m (54yd 2ft) from the ticket office.